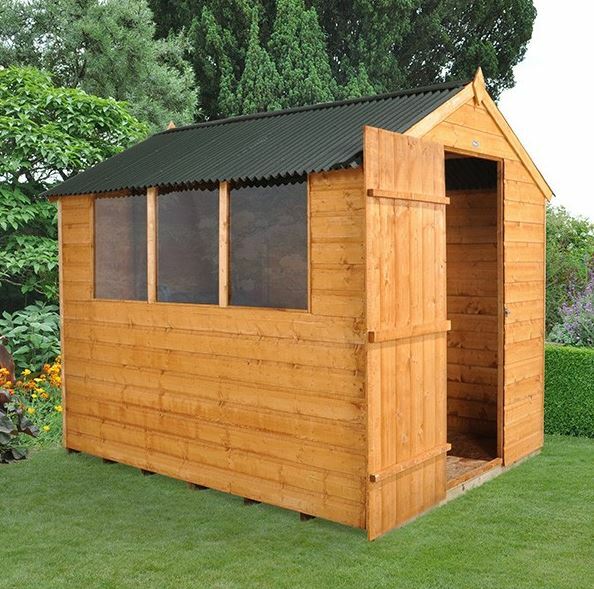 As far as mid sized shed go, you will have a hard time finding one that has as much class and style as the Hartwood 8′ x 6′ FSC Shiplap Shed. 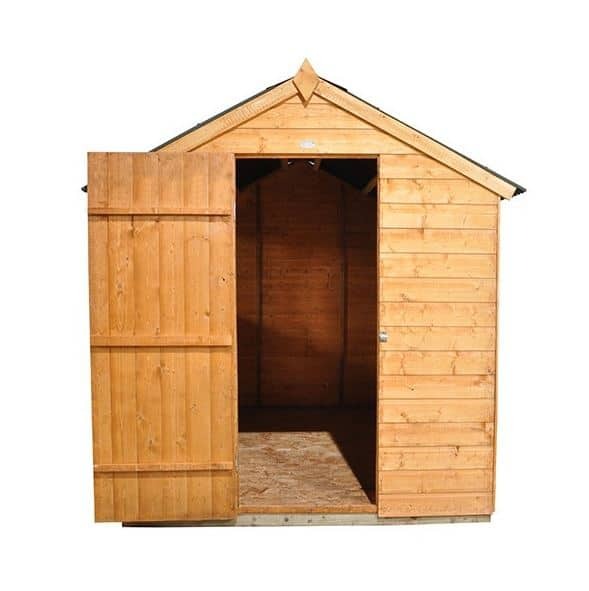 Offering you a good amount of storage space so that you can keep your tools, gardening items, kids bikes and toys or anything else that you may need to keep out of the rain, off the lawn and from cluttering up the house. 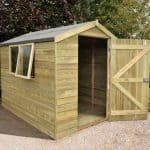 A good sized single door has been used so that even your larger items will be able to get in and out of the shed with no problems and those three fixed windows will ensure plenty of light gets in the shed. Making the shed stand out from all the other similar sized sheds is a high quality and fantastic looking corrugated roof. It is not just that corrugated roof that is high quality. From top to bottom this is one very well made shed. Smooth, watertight and thick, tongue and groove shiplap cladding gives the shed a very smart look. This cladding along with the robust frame it is attached too makes this one very strong structure that is going to last for many years. The floor has been made so that you can put plenty of heavy items inside here and not have the floor become weak under the weight. 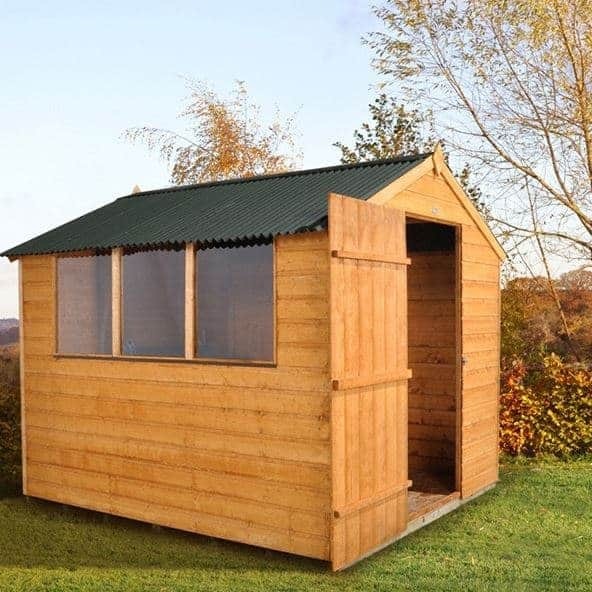 For those of you who want your shed to have that little bit extra class and high quality, we have the awesome Hartwood 8′ x 6′ FSC Shiplap Shed. We really like the way that this shed looks and feel that it has a much higher quality look than what many other sheds are offering. 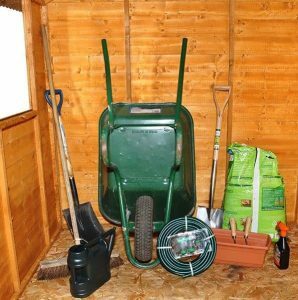 If you want something that is more than just a place to throw in your gardening equipment and tools, then is the shed for you as it will be a very prominent feature in your garden. We really like the size of this shed as the 7 feet 10 inches of depth and 6 feet 9 inches of width make it one of the more larger, mid sized sheds out there. The space offered means you can store plenty of items, even larger ones like bikes and a mower. The height of the shed is great as you have 7 feet of headroom along the ridge so no need to hunch over when you are in here. At the eaves the height is 5 feet which is a couple of inches shorter than we expected, but still this is not really out of line with what other sheds offer. The roof is one of the main features of this shed. We are so used to seeing some kind of felt on shed roof that when something else does come along it really does put a smile on our faces. They have gone for an Onduline corrugated roof which gives this a very unique look it also makes the roof waterproof so those solid sheet boards that are under here will be safe from the rain. The apex nature of this roof is what gives you all that generous headroom inside the shed. It is not just that corrugated roof that gives this shed its personality and high quality look. The tongue and groove shiplap cladding is a huge part of what makes this such a fantastic looking shed that is sure to make the neighbours green with envy. This cladding has a smooth look to it, but it is also very tough and will not allow water inside the shed. A robust 28 mm x 28 mm framing is used to keep the shed together. We really like this style of frame as it make the shed stay strong for many years and you do not have to worry about the shed starting to become weak as the years go by. The way that they have attached the cladding to the frame is very clever and gives the shed some extra strength that will really impress you and if you have kids it will help it take the kind of abuse the kids will throw its way. They have used solid sheet boarding for the flooring which in its own right is strong, long lasting and cost effective flooring. This kind of floor is able to take a lot of weight and with the floor joists they have used it is also going to be a good couple of inches off the ground. While this flooring they have used is good, we do wish that they had gone for something like tongue and groove boarding as it would have looked fantastic with the cladding. A basecoat treatment is applied to the wood before it is sent your way so during delivery and installation it will be safe from the elements, but this is the kind of shed that will require a generous coating of wood treatment within a week or two. 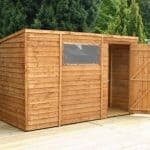 To ensure the shed has a long lasting and rot free life, an annual coating of wood treatment will be required. 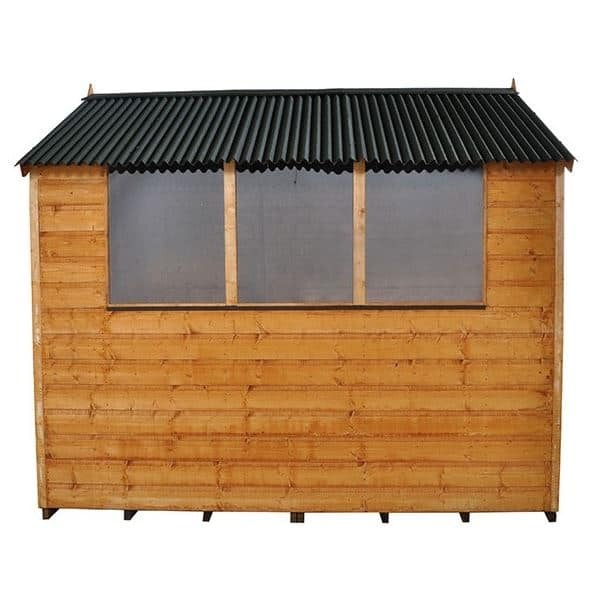 The Hartwood 8′ x 6′ FSC Shiplap Shed does come with a ten year anti rot guarantee. 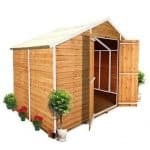 This is a very generous guarantee and it is valid as long as you treat the shed regularly. The first thing we noticed about the door is the way they used this very nice vertical cladding which stands out from the rest of the shed very well. We are impressed that even though this is a single door, it is still over 2 feet wide and an impressive, 5 feet 5 inches high. Three braces and a set of strong hinges are used to keep the door where it should be and also ensure it does not have a flimsy and cheap feel to it. Three fixed windows made from anti shatter polycarbonate are along one side of the shed and these windows will allow plenty of natural light inside the shed. As they are fixed, if things do get let’s just say a little ripe inside the shed after you have been in here for a little while, you will have to resort to opening the door to let in fresh air. 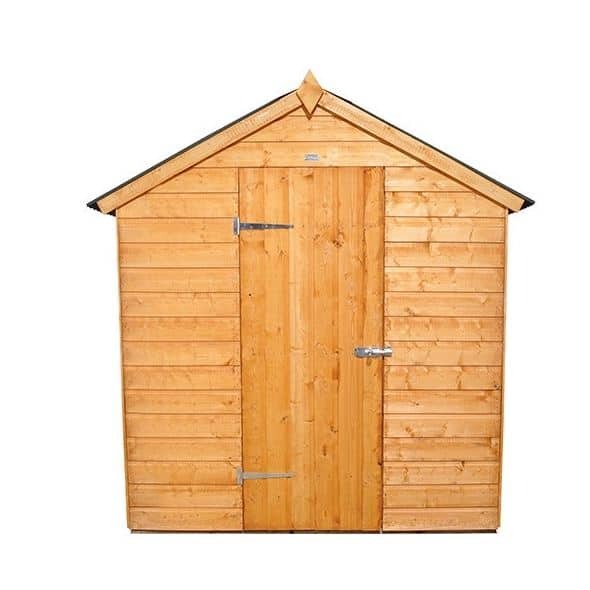 In general the shed and the door are both very secure and they have included a pad bolt which is a step up from a turn button. But still this is not going to lock the shed door and keep thieves out so if you do want to keep expensive items inside this shed then a locking mechanism of some kind will need to be added. If you want to make sure that those three fixed windows are covered up then blinds, curtains or just a bit of fabric can be used. Even without covering them up, we feel that the windows are not so large that it makes it easy for a person to be walking by your garden and look inside. 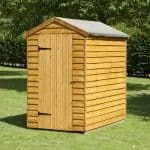 We suggest that before you treat the shed, you have a think about using a more colourful type of wood treatment. If you like the all natural look then by all means go for a clear or a brown coloured treatment, but you can get all kinds of colours these days so if you want to give the shed a bit more flash then try a wood treatment that is red or some other kind of brighter colour. They do offer a few extras for this shed, starting with a plastic shed base that will give the floor a little bit more support and keep it from sitting directly on the grass. While practical, we do feel that the £119.99 asking price is a little on the high side. If a padlock from Poundland does not sound all that appealing to you then they do offer a couple of security options. First up for £19.99 is a Yale Hasp Steel Black Finish 120 mm & Brass 40 mm Padlock. 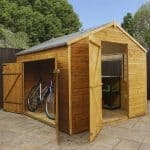 This is a great way to keep the thieves out and it goes with the design of the shed very well. If you want a bit more security, then they do also offer a very cool Yale Super Durable Deluxe Shed Alarm Security Kit, which comes in at a fairly reasonable £29.99. We really like what they have done with this shed. While it may be easy to focus all the attention on that corrugated roof, the rest of the shed is also very high quality. Getting over 20 years out of this shed is realistic, but while the materials are strong and long lasting. 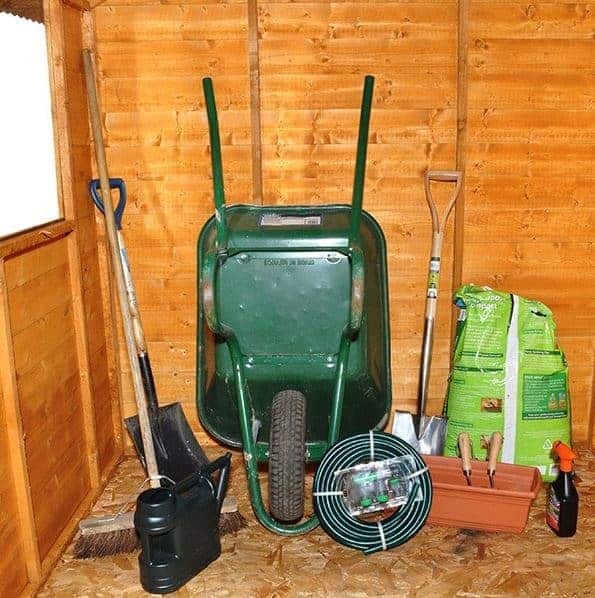 To keep the shed free from rot, you will have to remember to treat it on a regular basis. This is a mid sized shed, but it still is offering you a nice amount of storage space so if you are smart with how you store things then you are going to be able to keep many things in here. A friend or family member will be needed to give you a hand installing this and not counting snack, tea and argument breaks, you are looking at about 4-6 hours to install this. To be honest with you, we see this as a fairly straightforward DIY job do not worry about it too much. While you can get a similar priced shed for less money, we feel that the corrugated roof and that amazing cladding and frame make this worth the extra money. Final Thoughts: We really like the Hartwood 8' x 6' FSC Shiplap Shed and feel that with its combination of a corrugated roof and that smooth tongue and groove shiplap cladding, that it does stand out from similarly sized sheds. The price may be a bit higher than you would expect, but when you consider the materials used, the price is actually very fair and we are sure once you have installed it, you will feel very happy with your purchase. This is a great shed and ideal for those of you who want a shed that has a bit of personality to it as well as offering you a decent amount of storage space.